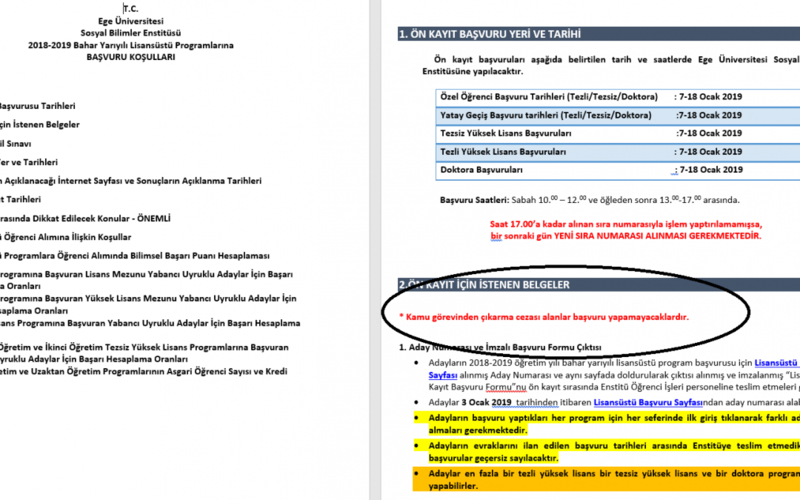 Izmir-based Ege University was revealed to be discriminating against those who were dismissed from their jobs as part of the Turkish government’s post-coup crackdown in the aftermath of the July 15, 2016 failed coup. The university’s Graduate School of Social Sciences announced on its website that those removed from the job are not allowed to apply to the master’s program. Turkey survived a military coup attempt on July 15 that killed over 240 people and wounded more than a thousand others. Already increasingly-authoritarian Turkish government has leveled up its crackdown against its critics since then with broad interpretation of its anti-terror laws. More than 150,000 people including thousands of academics were removed from their jobs at public institutions so far.